I make the same New Years Resolution each year. I vow that I will somehow find more time to practise my trombone, ride my bike more, and eat fewer biscuits. I never succeed, but at least it means I still have something to aim for the following year; after all if I were to actually manage it in 2012, what would I do in 2013? One resolution I don’t have to make, of course, is to ride to work more often, because I already ride to work all the time. However, it seems some people are considering it for 2012. I have heard a few people in the office talking about it; including a hilarious conversation between someone who gets the train from Paddington, vs someone who drives from Newtown. Both of them were bemoaning the time it took them to get to work (up to an astonishing 45 minutes!). 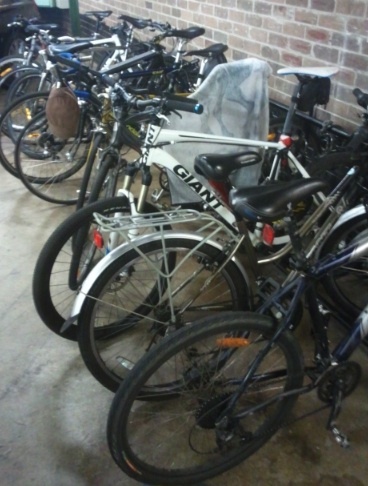 The office, by the way, is in the CBD – probably ten minutes by bike to both locations. Heck, I could probably give one of them a lift home on the Radish faster than they manage it today. But is all this talk turning into action? Well, it seems like it might be. The combination of the new CBD bike lanes (thanks Clover!) and the need to reverse the effects of seasonal over-indulgences seems to be working, and the bike rack in the basement car park has been full every day since early January. It’s great to see, and I hope they all keep it up. Of course, it’s still really rather pitiful; there are about thirty spots to park bikes, and the building houses perhaps three thousand people. So that’s only about one percent of them arriving by bike. However it’s a start, and hopefully momentum will continue to grow. I am sorry, dear readers, for the hiatus in regular posting on my blog. I took a break from it over the summer, as we moved house, had family descend and generally just seemed to be crazy busy. However, hopefully normal service can now be resumed – thank you for your patience. And what better place to start than with the biscuits I was given over the festive season. Two novelty Arnott’s packs, indeed. 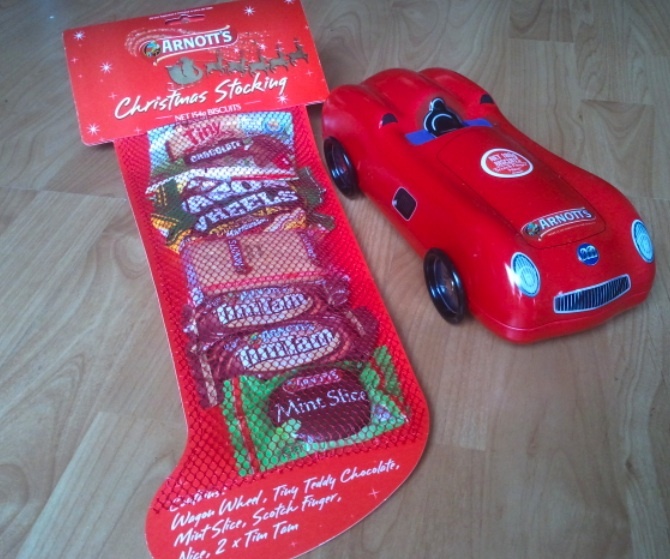 The first was a kind of cardboard stocking thing, containing two Tim Tams, a Mint Slice, a Scotch Finger / Nice combo, a Wagon Wheel and some Choc Tiny Teddies. The best bit of this was the individually wrapped Tim Tams. They feel much more grown-up when individually dressed up, and I really think that there could be a market for packets of six of these, for popping in lunch boxes and so on. Or perhaps it’s just nostalgia for the Penguins of my (British) youth. The other, much more exciting one, was a tin in the shape of a car. This I was very pleased with, and made ‘brumm brumm’ noises as I drove it around the floor, much to the delight of Toddler Chillikebab, who than proceeded to do the same. What I didn’t reveal to Toddler Chillikebab was that the top came off, revealing a number of packs of the ‘Scotch Finger / Nice’ combo. Here’s to a 2012 full of happy biscuit eating!